There are many types of injuries that result from truck accidents in Massachusetts. 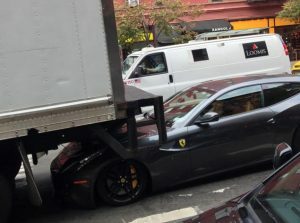 In a case involving a truck back up accident in federal court , the decision of the court noted that “there is little difference between backing a truck when you can’t see what is behind you, and driving forward when blindfolded.” See Murray v. Whatt 95 S.E.2d 541 (1956). Collisions between trucks and other motor vehicles, or pedestrians, can be catastrophic. Perhaps the most egregious of all are the truck back up collisions, because they can and should be prevented with minimal undertaking by the truck drivers and the company policies that they follow. How? Truck back up collisions are not high speed collisions. Nevertheless, because of the size and momentum of the trucks, and because once a slow speed collision begins there is usually no way to stop it, the injuries that result are often catastrophic. Why do we not call them “accidents”? Usually truck back up collisions can be prevented; there are known blind spots so not backing into those spots is critical. Backing into them is negligent; when that happens, and someone is injured, the injuries can be fatal. Typically the driver in those collisions was either not complying with standard safe back up rules, or the owner of the truck did not furnish modern tools and technology to aid and assist the driver. It is estimated that over 400 people per year are killed in truck back up collisions. Almost half of those are under four (4) years old. What are the measures that could and should be used to prevent these deaths? First, simply getting out and looking before backing up will generally clear most folks and dangerous situations. This method, called GOAL (Get Out And Look) can be safely undertaken in almost all situations prior to backing. Second, using a spotter, which costs money but adds dramatically to safety, is simple and reliable. Third, using available technology such as back up beepers, motion detectors and video cameras. The costs of securing these technologies, or a spotter, is minimal, considering the profits of the companies owning the trucks or accepting the deliveries. At least this is what we have discovered in truck accident lawsuits in Massachusetts. Many cases involving injuries caused by negligent truck drivers in Massachusetts require litigation. In the course of the lawsuit we look at what could have been done, by the driver and by the company, to prevent injury. Many times the driver failed to comply with company rules, or federal regulations. Many times the driver was under pressure, by his employer, to skip the company’s own rules because of time constraints. Careful discovery of these facts can greatly enhance the likelihood of success at trial; and, therefore, the chances of settlement pre trial. When we file a lawsuit in a truck back up case, we expect a great deal of “discovery” in order to prove our case. We will likely need an expert to determine what the truck driver neglected to do; what he or she did, or failed to do, that caused or contributed to the accident. We need to secure copies of logs, repair records, driving records, the accident report, and of course witness statements. We need to build the facts to show that the driver was negligent. The National Highway Traffic Safety Administration truck backover report, issued in 2006 indicated that in addition to deaths, there are approximately 6,700 to 7,400 injuries from “backover” collisions per year! The NHTSA report noted that many technologies, marketed as parking technologies, were ineffective. The sensor or radar technologies did not work in detecting children, for example. Cameras are more effective, but the research indicates that it is important for the drivers to know the limitations of their cameras and their own skills in using the technology. Sun glare, fog, and other environmental issues may reduce the effectiveness of the cameras. Technologies change, and vary, so in the course of litigation we look at what was available at the time and what was used, or not used. If you or a loved one are injured from a truck backup collision in Massachusetts call a Massachusetts truck accident lawyer with experience for over 25 years. Our number is 617-227-7423. Our consultations are free. We charge our clients zero until we win!